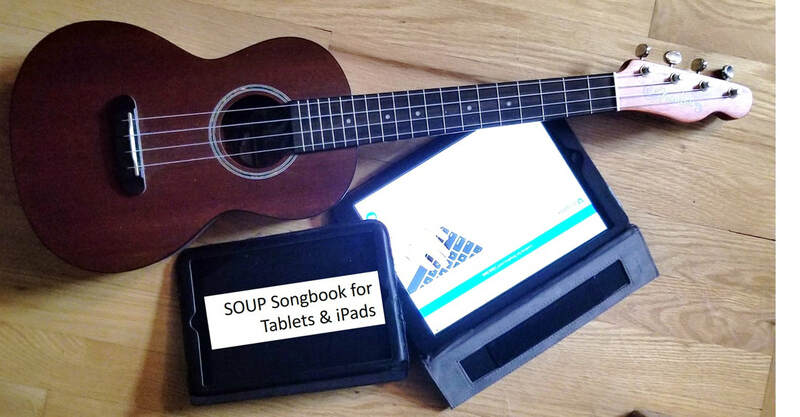 Click here to find about about the SOUP Songbook for Tablets. SOUP also has print copies for sale, available at a SOUP Wednesday night jam. About Jam Session "Trial Songs"
From time to time, test copies of songs are circulated at the jam session before being officially added to the SOUP songbook. Songs under consideration and testing at jam sessions will not appear on the official song list and will not have a number. Here are a few tips to help you understand notation used in the Songbook. 1. One of the chord charts included in the Songbook is the “SOUP Songbook Basic Chords” chart. Chords on this chart will not have diagrams in the Songbook, so it would be helpful for all players to know how to play these “basic chords”. 2. If chords are in parentheses, e.g. (G7) (C), these chords are played only at the very end of a song. You may often see chords in parentheses at the end of a chorus. Don’t play them until the very last time through the song. 3. Slash marks, e.g. / / / / are used to represent rhythm in some Intros, Outros, and Instrumental Bridges, and to guide the beat count in tricky sections of some songs. Each slash represents one beat. 5. Notation for downstrums (d) and upstrums (u), is used for some suggested strumming patterns. Capital D or U means the emphasized beat. So, e.g. a calypso strum, which has its emphasis on the second beat, may be indicated as: dDu udu. 6. Sometimes an arrow will be used to indicate the rise or fall of the melody if there is a particularly “tricky” section; e.g. “…when we live in a world of our ↑own”. 7. Sometimes a beat count is given, particularly to help with the count between sections of a song, such as between a Bridge and verse. This count is given in parentheses (2 3 4 1 2 3 4). 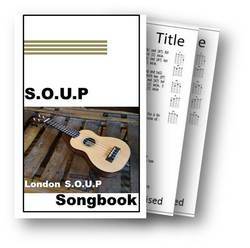 SOUP Songbook Basic Chords chart. Chords on this chart will not have diagrams in the songbook, so it would be helpful for all players to know how to play these “basic chords”.